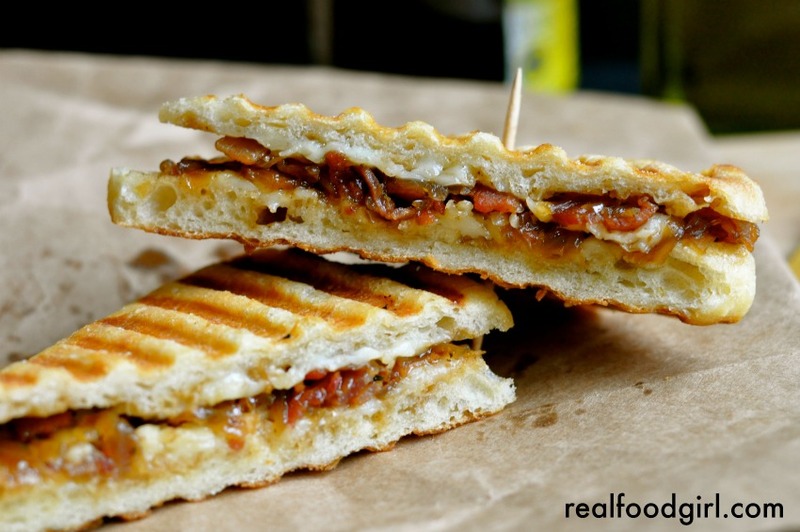 Bacon, caramelized onions, Gruyère cheese and golden, buttery, toasted bread. Are you hungry yet? If not, please have someone check you for a pulse. Maybe even take your temperature. Go ahead. I’ll wait. Pulse? Good. Hungry now? Perfect. I knew probably didn’t hear me mention bacon and melted cheese. For the past two weeks I’ve been working hard on updating some old posts with new photos, and even revamping the recipes enough where I felt it was best to just write a new post and link to the old one for a couple of reasons. One- we all get to see just how far I’ve come since I started blogging, and two- these recipes were just not getting the attention they deserved and I felt that just replacing the photos wasn’t doing them justice. So they’re getting brushed off, and cleaned up and made over. This recipe is another make-over from an oldie but a goodie which you can find HERE. 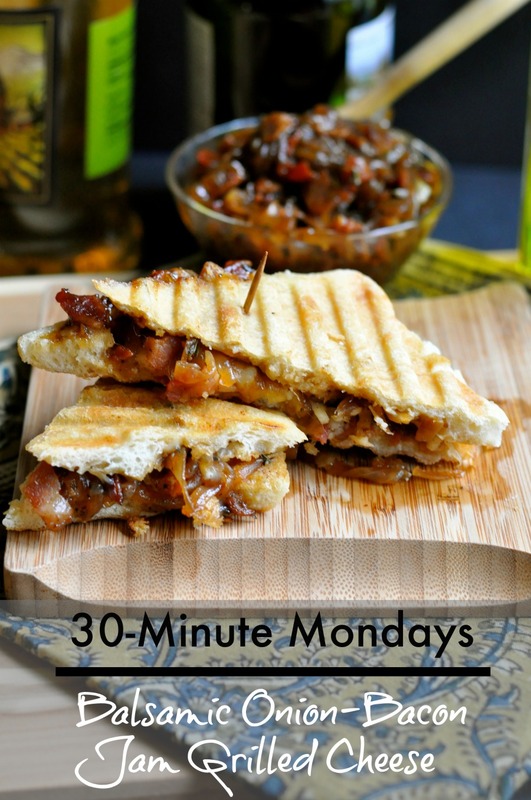 This sandwich starts with my well-loved Savory Balsamic Onion-Bacon Jam recipe. You can’t make this grilled cheese without the bacon jam. I hope you have some on hand. It is very easy to make so if you don’t, you can have some whipped up in about 40 minutes. And you’ll have enough left over to toss some of this on or in a juicy burger, too. Mmm! Every Monday and Tuesday, I am at my computer for about 12 hours straight. So Monday and Tuesday nights are The Stud Muffin’s night to cook dinner. I’ve spoiled him so much over the past 20 years that he’s forgotten about 90% of his cooking skills. That kind of bums me out, but if I can keep things like this “jam” on hand, and a few other dishes, he can whip something tasty up in no time and I can peel myself from my computer long enough to get some nourishment into my body. I appreciate that he helps out like this so that I can accomplish what is necessary during these two days. I’m a blessed woman. 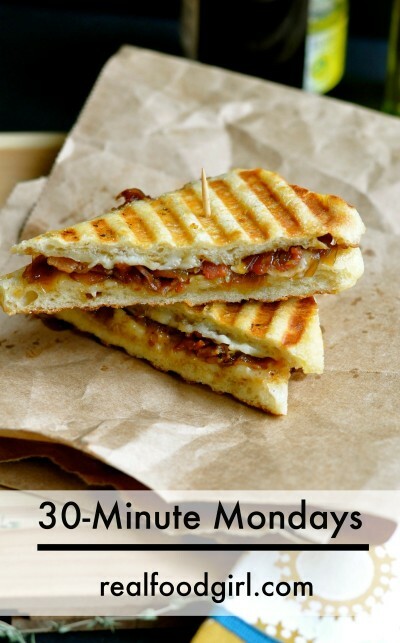 This is a 30-Minute Monday dish that is right up TSMs alley. He can make grilled cheese sandwiches like nobody’s business and he also likes to use the Panini press. Let’s be honest. Who wouldn’t. We love our Panini press. This sandwich comes together quickly. I used an raw-milk Gruyère cheese that I shredded myself to ensure it would melt easily once grilled. For the bread I chose a Ciabatta loaf, but a French baguette would have been more suitable in my opinion. The Ciabatta just wasn’t substantial enough to hold up once it was grilled, so I ended up with a flimsy sandwich. This doesn’t lend to tasty looking photos, but I was determined to make it work. Lastly, I was thinking that a thin layer of fig jam spread on each slice of bread before adding the bacon jam and cheese would have added another divine layer of fabulous flavor for this sandwich- but I’ll have to try that another time. What is your favorite grilled cheese sandwich? Do you like to add meat to your grilled cheese, or are you just in it for the cheese? Oh, and what is your favorite cheese to use in grilled cheese sandwiches? Interested in some of the items used to make this recipe? 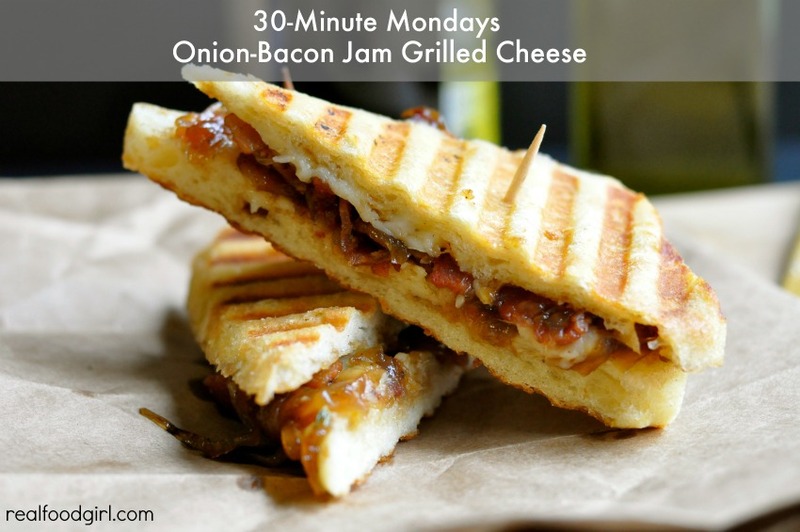 Luscious caramelized onion and bacon "jam" and Gruyere cheese nestled between two buttery, golden, toasted slices of bread. This is a grilled cheese to behold all grilled cheese! Cut the baguette into 4 even-sized hunks and then carefully cut it through the middle (like you would slice a bagel) so you have top and bottom pieces. Brush the bottom and top (outside of each slice) with melted ghee or olive oil or a mixture of both. Spread a thick layer of the onion bacon jam onto the bottom of each slice. About 1/3 cup per sandwich. 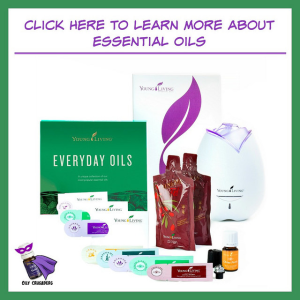 You may add more or less- totally up to you and what you prefer. Sprinkle an even amount of the Gruyere on top of the onion jam layer then place the top piece of bread over the cheese layer and press down lightly. Place sandwich on the panini press and grill until GBD (golden brown delicious) about 5-7 minutes, OR grill on each side 2-3 minutes in a skillet over medium heat until golden brown on each side. Serve immediately- cut in half before eating. This will take around 5 minutes. 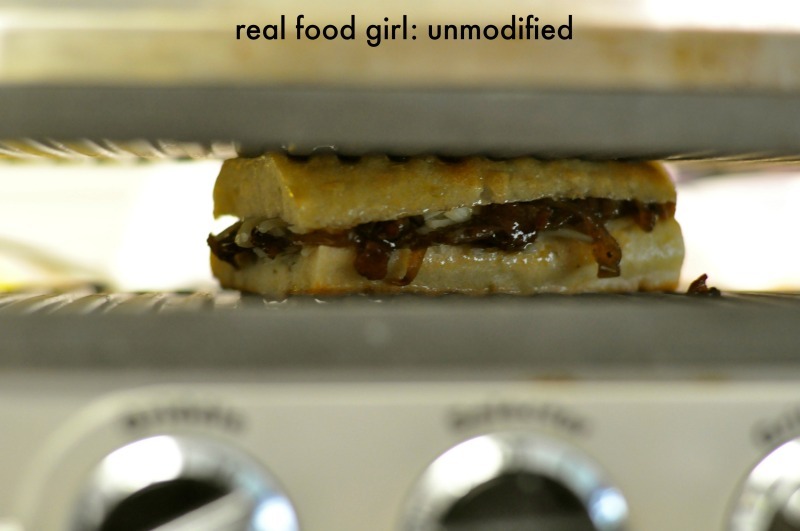 It may take more or less depending on the type of bread you use and/or the brand of panini press you own. A crusty bread like a baguette will take longer, a simple sliced bread like sour dough or wheat bread will take less time- it will also be a bit soggier than if you used a baguette, French bread or a ciabatta roll. If using a crusty roll or bread, press down on the sandwiches the last 60 seconds of “grilling” so that they’re nice and flat. 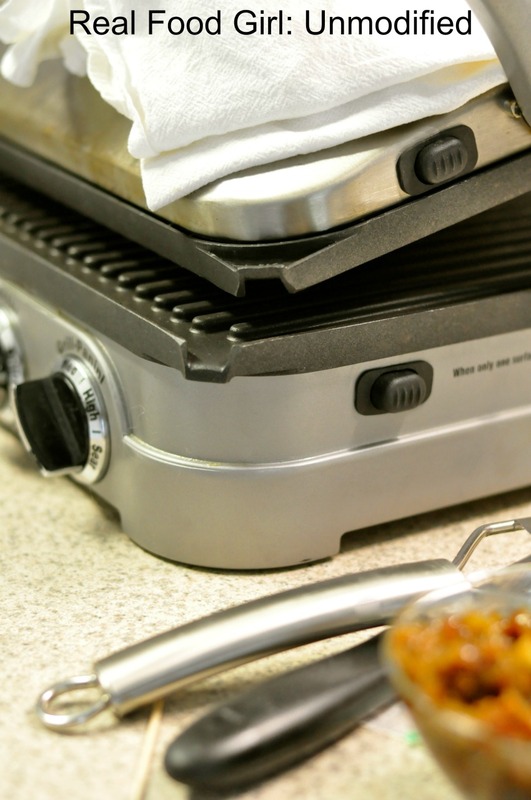 If using a panini press, angle the front of the press down at the front of the sandwich to keep the top layer of bread from sliding off the sandwich while grilling. One the sandwich has "set" go ahead and level out the press so that it is evenly pressing down on top of the sandwich and then press on your handle to flatten and grill the sandwich until golden brown. Um. I just died and went to heaven and I haven’t even tasted this! My God Kristine, you are a food goddess! I could totally get used to being called a food goddess! 🙂 Thanks, Loriel!